Xiaomi India, today inked a deal with Google and announced the first smartphone under the collaboration. As it was rumoured earlier, the device is named as Xiaomi Mi A1. The Mi A1 is the company’s first smartphone with dual cameras in the Indian market. The Mi A1 will be available in three colour options- gold, matte black, and rose gold. The highlights of the Mi A1 is, of course, the dual rear cameras, but what sets this device from the competition is the stock Android support. Diving into the specifications of the smartphone, the Mi A1 weighs just 165grams and measures just 7mm in thickness. The smartphone is entirely built out of metal and it resembles the Mi Max 2 smartphone with an iPhone-esque antenna band design. The primary highlight of the smartphone is the dual rear camera setup at the back. The Mi A1 has two 12MP sensors at the back. The primary sensor captures RGB shots while the second sensor has a telephoto lens. The smartphone also comes with a bokeh mode. Xiaomi claims that the bokeh mode in the A1 works flawlessly and better than any other smartphone in its price range. The rear camera comes with Beautify 3.0. The company is introducing a new feature called Smart Beautify, which improves the colour correction. With the telephoto lens, users can capture 2x optical zoom images and up to 10x digital zoom images. However, the smartphone doesn’t come with Optical Image Stabilisation (OIS) support. The Xiaomi Mi A1 is powered by the Qualcomm Snapdragon 625 chipset, which is an octa-core chip clocked at 2.0GHz. Xioami seems to be in love with the Snapdragon 625 chipset because this is the third Xiaomi smartphone to launch in India with the said SoC. The other Xiaomi devices with Snapdragon 625 are Xiaomi Redmi Note 4 and Xiaomi Mi Max 2. The chipset is paired with 4GB of RAM and 64GB of internal storage. The Mi A1 includes a 10V smart power amplifier to boost the sound quality. The Mi A1 comes with a Pyrolytic Graphic Sheet on top, which helps the device to stay cool all the time, even on heavy gaming sessions. Finally, Xiaomi has gone with a USB Type-C port on its smartphone. The smartphone also comes with 380V charger, exclusively in the Indian market. Just like other Xiaomi devices, the Mi A1 also has IR blaster support. This entire package is backed by a 3080mAh battery. The device has a fingerprint scanner located at the rear, within reach of your index finger. 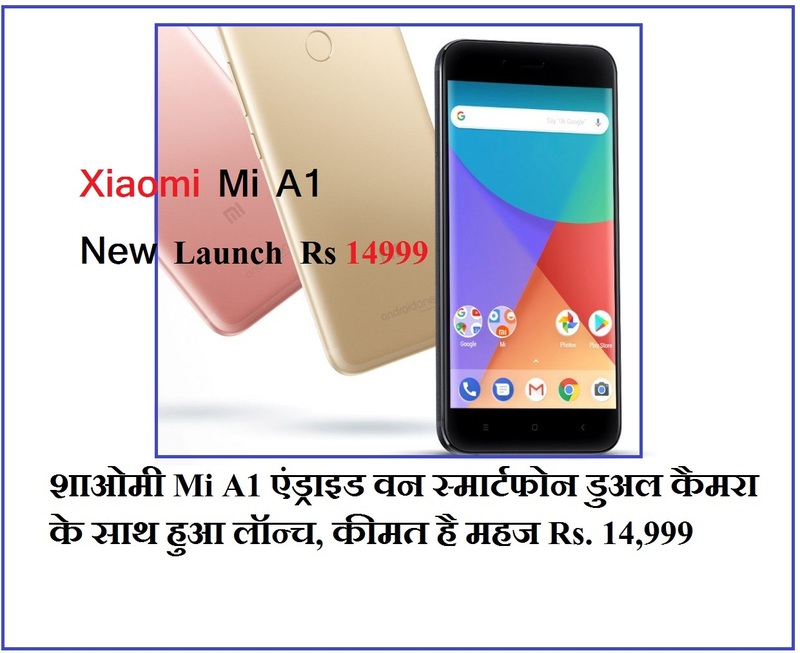 The Mi A1 is a smartphone ‘Created by Xiaomi, Powered by Google.’ Xiaomi and Google collaborated for the first time to announce this product. The Mi A1 receives software updates right from Google’s house. This device is also the part of Google’s ambitious Android One project. Google also promised that the Mi A1 will receive Android 8.0 Oreo update by the end of 2017, which is a great thing. And it will be one of the first devices to get Android P update as well. The device doesn’t feature any bloatware and comes with important Xiaomi apps such as Mi Remote, Mi Store, etc. Google is also offering unlimited Google Photos storage with the Mi A1. Lastly, the Xiaomi Mi A1 will retail for Rs. 14,999 in the Indian market, and will be up for sale exclusively on Flipkart. Xiaomi also partnered with Airtel and offering up to 200GB free data for Mi A1 buyers. The device will be up for sale from September 12. 1 Response to "Xiaomi Mi A1 Andraid One SmartaPhone Dual Camera ke Sath Huaa Launch Rs 14999/-"
Comprar en línea nuevo barato xiaomi mi a1 en Asturias & Oviedo a ecoim.es. Disponible para Comprar barato xiaomi mi a1 . 4GB/64GB 4G Dual Sim 228,00 € (IVA incluído).